The presentation of the optical principle of the reflecting telescope can be traced back to the catoptrics of Hero of Alexandria, the first-century CE mathematician, engineer and inventor. 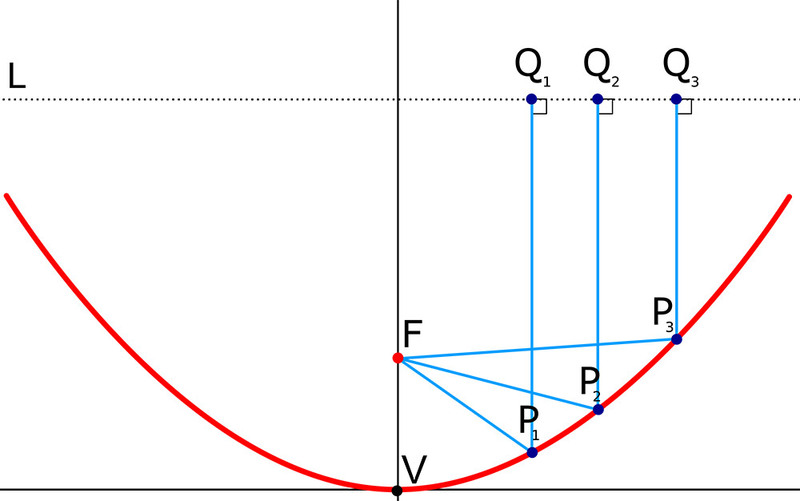 He demonstrated that a curved, parabolic mirror focuses parallel incoming rays, creating an image. There is no evidence that Hero built actual reflecting optics. Today, though, we routinely see Hero’s concept on the roofs of buildings in the form of satellite-television dishes, which concentrate radio transmissions to a tight focal signal. Knowledge about the focusing properties of curved mirrors re-emerges in the work of the medieval Islamic opticians, most notably in the 10th-century treatise On Burning Mirrors and Lenses by the Persian scholar Abu Saʿd al-ʿAlaʾ ibn Sahl. Unfortunately, Ibn Sahl’s work appears to have had little impact and was rediscovered only in the 20th century. Hero was a favourite author of the Italian Renaissance artist-engineers, so it should come as no surprise that the principle of the reflecting telescope appears again in an unpublished manuscript of Leonardo da Vinci. But Leonardo’s interest, too, remained hypothetical, with no actual attempt to construct such a telescope. Even if it had worked, Zucchi’s telescope contained only one mirror and so was not a full reflecting telescope. All true reflectors have at least two mirrors: a primary mirror that forms the image, and a secondary mirror that projects the image out of the body of the telescope. The first plans of two-mirror reflecting telescopes appear in Harmonie universelle (1636) by the French mathematician and physicist Marin Mersenne. He never tried to realise his designs, probably aware of the daunting problems of constructing parabolic mirrors. Only at this point does Isaac Newton enter the story. Around 1668 he managed to produce a functioning reflecting telescope using a mirror made of a copper-tin-arsenic alloy of his own devising. He cheated a little, building a spherical mirror that does not produce a fully accurate image but that is much easier to grind and polish than a parabolic one. Still, one should not underestimate Newton’s abilities as a craftsman. His telescope was sufficient to view the four large moons of Jupiter. It was as powerful as many of the refractor telescopes of the time, and much more compact. Years before Newton publicly revealed his instrument, the Scottish mathematician and physicist James Gregory had published a slightly different design for a reflecting telescope, using a parabolic primary mirror and an ellipsoidal secondary, in his Optica promota (1663). Unlike Mersenne, he attempted to build his device and, unlike Zucchi’s, his was a full two-mirror reflector. Although he employed London’s best lens-maker, Richard Reeve, to make his mirrors, Gregory was unable to achieve the necessary quality to produce a usable image. Newton’s rival, Robert Hooke, reportedly succeeded in producing a functioning Gregorian reflector in 1674, but it remained a one-off and it has not survived. Two years earlier, Hooke had been the one who forwarded Gregory’s claims against Newton. Also in 1672, the physician Jean-Baptiste Denys published a letter in a French journal claiming priority for his landsman Laurent Cassegrain, who had also written up a design for a reflecting telescope. Little is known about Cassegrain, including whether he or anyone else tried to construct his telescope in the 17th century. His design, which used a parabolic primary mirror and a hyperbolic secondary, was especially complicated to grind. Gregory’s and Cassegrain’s designs did not immediately lead to usable instruments. Then again, neither did Newton’s. His spherical mirror could not be scaled up effectively, leaving it as something of a scientific curiosity, even though a reflecting telescope has many advantages over its refracting cousin. 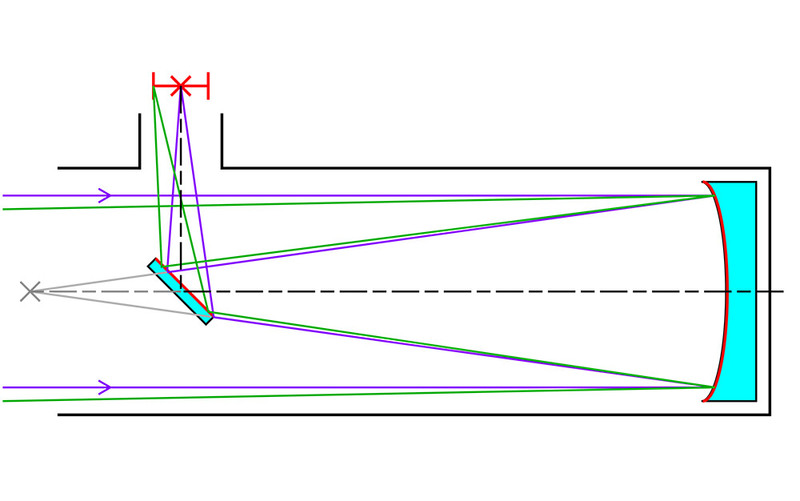 Early refracting telescopes were plagued with two major optical problems, known as spherical and chromatic aberration. First, a simple lens whose curved surface is a segment of a sphere – the only type possible with 17th-century technology – does not focus light at a single point, so it produces an inherently distorted image. Such spherical aberration could be reduced by using lenses with extremely long focal lengths, but that solution led to ever-longer, more unwieldy telescopes. The second problem, chromatic aberration, was what motivated Newton to develop a reflecting telescope in the first place. Each colour of light bends with a slightly different angle when passing through a lens. In a rainbow, this effect is beautiful. In a refractor telescope, the red-light image forms a small distance away from the blue one and so forth, leading to blurring with coloured fringes. A reflecting telescope, having no lenses, produces a sharper and cleaner image than a simple refracting telescope. Nevertheless, it wasn’t until 1721, more than 50 years after Newton constructed his first telescope, that the English inventor John Hadley succeeded in building a large-scale Newtonian reflecting telescope (and not with Newton’s spherical mirror design). Members of the Royal Society tested it against Christiaan Huygens’s 120-foot-long refractor and declared it superior. Hadley went on to produce a functioning Gregorian telescope, too. More importantly, he was able to teach a repeatable method of grinding and polishing metal mirrors to the leading instrument-makers of the time, enabling the serial production of high-quality telescopes. Today, all the leading astronomical observatories, including the Hubble Space Telescope, use reflecting optics. Whom should we credit for this advance? Hero, for his conception? Zucchi, for his attempt at construction? Newton, for his successful prototype? Or Hadley, who made the reflecting telescope viable? All of them were necessary, but no one’s work was sufficient. The lesson here applies far beyond this test case. For almost any device, claiming one individual as the inventor is problematic, to say the least. Conception, demonstration and implementation can be very different things, and the path connecting them is typically not a line but a long, challenging and tortuous route.